Asus Eee | This used to be my second life as a verb. Without reading the manual, I decided to set up the wireless router today. I plugged it in, turned on the Mac and configured away. It worked. I was happy. I turned on the Asus Eee. The connection worked, too. I figured that was that. Later in the afternoon, I brought the Asus Eee into the bedroom, so I could surf a bit before joining Lucien for siesta. I tried connecting, and got a surly “no DHCP offers received” message from the Eee. I tried thrice. No luck. The connection was always “pending,” like those really useful bills in Congress. I googled my problem and ran into others with similar issues at the eeeuser forum. I reset the router around five times, fiddled with leaving it open, using WEP or WPA, created a connection entry under the Networks app and finally got it to work. I don’t know which thing I did worked, exactly. It could have been a matter of throwing out an entire bunch of banana peels, crossing my fingers, and slipping on the right one. The Asus Eee is out and about! No, I haven’t customized its desktop, gone into advanced mode or installed additional programs, but the Asus Eee doesn’t mind at all. A brass band leading a procession of umbrellas just trudged by. It is not a good day to be having a funeral, not this close to Christmas. Sundays are the best days to have funerals in this town. When we walked Lola Que to church, there was another incoming we had to swerve to avoid. I expect it’s because most of the guests would be able to spare time on a Sunday. I mention this because I can. We were never wired, or wireless, whenever we would stay here. The bamboo straining in the wind, the angry insectoid drone of tricycles, the narcoleptic haze of an early afternoon in my hometown – I experience them as my fingers touch type, and the world balances somehow. 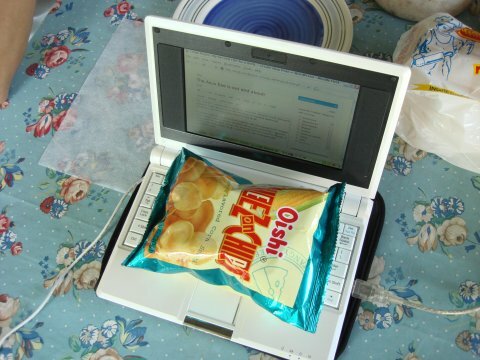 Yes, the Asus Eee is almost no match for a little pack of snacks.